Motorola really wants you to buy their new products. And we’re not just talking phones here, it could be almost anything from accessories to Chromecasts to baby monitors from what we can tell. 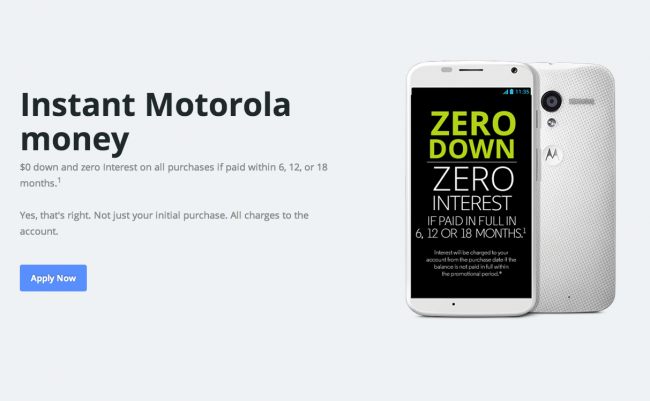 You can buy all of those things using their newly launched “Motorola money” initiative, or better put, a line of credit with Motorola that requires you to put $0 money down on purchases while seeing zero interest if paid off within 6, 12, or 18 months. They’ve entrusted Comenity Capital Bank to provide the lending, which if approved carries an APR 28.99% should you not pay your purchases back in full in those 6, 12, and 18 month slots. Things like phones or any other purchase over $549 will get you the full 18-month pay period. Purchases under will be subject to 6 or 12 month payment periods. Obviously, you need to be approved by Comenity Capital Bank in order to participate, so that means a credit check. But hey, if you don’t have cash up front and want to buy all sorts of Motorola products, this is an option. Cheers Anish, Kit, Mike, and Rashad!